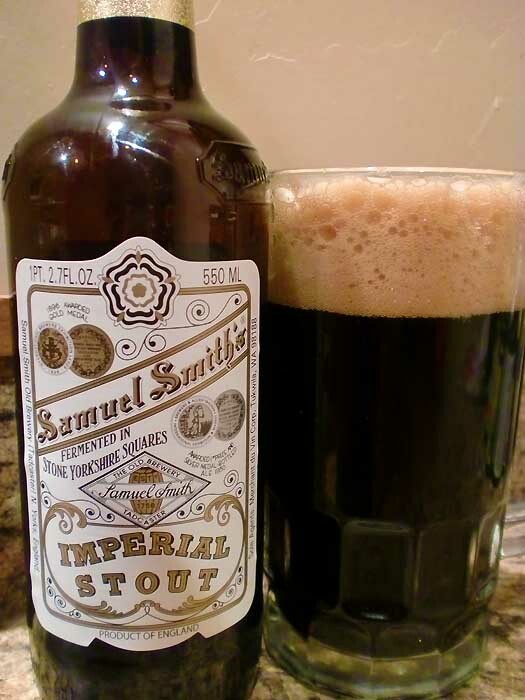 Samuel Smith's is kind of a legend in the Imperial Stout beer world. They were one of the first breweries several decades ago to bring the Imperial Stout category back to life... and thank goodness. As I've said before, I freaking love Imperial Stouts. Okay, apparently I just like high-proof beers. Granted, Imperial Stouts do tend to be my favorite of the high-proof bunch. Samuel Smith's is a brewery out of Tadcaster, England. Don't confuse them with Samuel Adams, or Samuel L. Jackson, or Samuel Clemens (*brownie points if you remember his other name). Although, I bet those last two guys would probably drink this stuff, and the first already make their own version. Being that Samuel Smith's Imperial Stout is a staple for the genre, my hopes were set high. So, does it deliver? 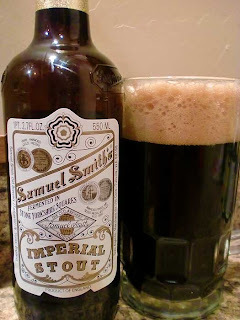 Samuel Smith's Imperial Stout pours black as sin and just as good, if you know what I mean. It has a super thick, creamy head. For the light beer drinker, I bet this appears quite daunting. The aromas are as expected, cocoa, espresso, dark fruity sweetness. You take a swig and are greeted with a luscious, creamy mouthfeel with dark roasted malty goodness, maple, milk chocolate, and an earthy bit of hops in the finish. The 7% alcohol is completely hidden beneath the creamy roastiness. Drink This: if you want a classic, extremely tasty Imperial Stout. It's almost comparable to drinking a chocolate covered coffee bean, but creamier and well, liquid of course. Samuel Smith's blows that pansy Guinness out of the water. This is honestly one of the best, most well-balanced Imperial Stouts. It's a classic for a reason. Don't Drink This: if you don't like dark beers... obviously. I'll have to give this stout a try. Stout are my favorite kind of beer. My favorite are from Southern Tier they make 4 of them Mokah (half choclate/coffee), Javah, Choklat, and Creme Brulee (vanilla,toffee,caramel) all are high octane beers but the 9+ ABV's are well concealed by flavor and sweetestness. Dave, sounds like you'd love the Samuel Smith's Imperial Stout! It really is a classic. I need to find some Southern Tier brews, I've only had a couple and it's been quite awhile ago. I need to track them down again so I can do formal reviews. Plus, like you said, I need to try their Pumking! I've heard nothing but great things about it!